I received the order in a timely manner, that being approximately three business days. Also i am quite pleased with the functioning of this order as well. Source Devices are easy to identify as they generally only have AV Outputs - they play your media and send the audio and video signals OUT. Hub Devices can be trickier, as they accept both Inputs and Outputs - they do all the sorting to organise multiple home theatre components. Sink Devices are the final destination for your video and/or audio, and have mostly Inputs - they display the video and play the sound that they receive IN. 'Sink device' is an industry term, so we tend to say destination device for clarity. Let's look at a simple home theatre setup that comprises of a couple of Source devices - a Games Console and a Blu-ray Player - along with a Television and a Surround Sound speaker system controlled by an AV Receiver. In this example, the Console and Blu-ray player are source devices. They have Outputs which are sending HDMI data (audio and video) out. The AV Receiver has Inputs which can accept both of these signals in - you select which one is active with your remote control - which it then sorts and sends on through its Outputs. Because it has both inputs and outputs, it's what we consider a hub device. Finally, the Television receives video data with its Input, and the Speakers receive decoded analogue audio signals, making them sink or destination devices. This simplified diagram does not take into consideration the non-audio/video abilities of some components. A games console may have input sockets for controllers or cartridges, but they're outside of the scope of this guide. We're just dealing with audio and video (AV). Features like these can allow some components to work like Hubs under certain circumstances. Let's look at an example where a TV is being used as a hub device rather than as a destination device. Here, we're using the SPDIF Digital Audio output on the TV to send sound data to a receiver, which decodes it for the speaker system. SPDIF can be either Optical (TOSLINK) or Coaxial (RCA), depending on the make and model of TV. Other devices also have SPDIF support, including games consoles and some projectors. The main benefit of this method is that everything shown on the TV plays audio through the speaker system, including free-to-air TV if connected. This solution is also good when your AV Receiver isn't HDMI-ready. One drawback is that you're mostly limited to 5.1 audio, as SPFID only works with PCM Stereo, Dolby Digital and DTS Surround Sound - it can't carry lossless surround or 7.1 formats. TVs and Projectors which have Headphone Jacks or 2-RCA analogue stereo outputs can also be used in the manner shown above, but you can only get regular stereo audio this way. Still, even a cheap pair of powered speakers should sound better than the ones built into your telly! The HDMI Audio Return Channel feature is an optional ability in HDMI v1.4 (and above) hardware that allows selected inputs to send audio data back from a destination device like a Projector or a Television to a compatible hub device. This effectively makes an HDMI input also an output - but only for audio! This example shows free-to-air television stations being received via a rooftop antenna plugged directly into a TV with a built-in digital tuner. In order to get audio back to the AV Receiver to make use of the home theatre speakers, HDMI ARC is leveraged to eliminate an additional audio cable. You aren't limited to just TV stations for ARC, either. If the Console and Blu-Ray player above were connected to the TV as well, their audio would also return to the AV Receiver. HDMI ARC can handle Dolby TrueHD and DTS-HD Master Audio up to 7.1 Channels, so it has many advantages. Not all HDMI sockets have ARC enabled, though! Look on the back of your TV, or in your user manual, to find the HDMI inputs specifically labelled as ARC. Both the TV and AV Receiver (as in the above example) have to support ARC for it to function. 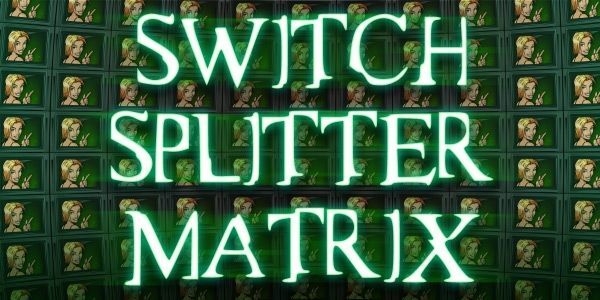 Switches, Splitters and True Matrixes are all considered hub devices as they accept one or more inputs, sort the signals, and direct them to one or more outputs. We have a whole blog dedicated to these devices, what they do, and when to use them. We also have animated signal flow diagrams there - check it out! At Cable Chick, we are frequently contacted by audiophiles both amateur and professional who are working with many specialised devices at once - often mixing old and new components that don't share common Input/Output formats. The following diagram shows what a complex home theatre system may look like. Wow! Now we can really see how the information is flowing. Here, we have a home theatre with a TV and Projector set up to show video from any one of three sources (one at a time); a Laptop, a Games Console and a Blu-ray player. For this to work, both the TV and the Projector need at least two HDMI inputs, and the TV needs an SPDIF audio output. The 5.1 speaker system (run from the AV Receiver in the middle) can play audio from any of the three source devices, plus sound from free-to-air TV broadcasts and a Vinyl Record Turntable. A Splitter and a Switch are included to direct the HDMI signals to both display devices. In this instance, the projector would not be able to show any TV stations, unless it had a built-in tuner and was also connected to the rooftop antenna. All other sources are available on both screens after a quick fiddle with the relevant remote controls! By understanding how information moves between Outputs and Inputs, you can start to piece together a hypothetical home theatre system like a jigsaw puzzle, and figure out what solution will work best for you. 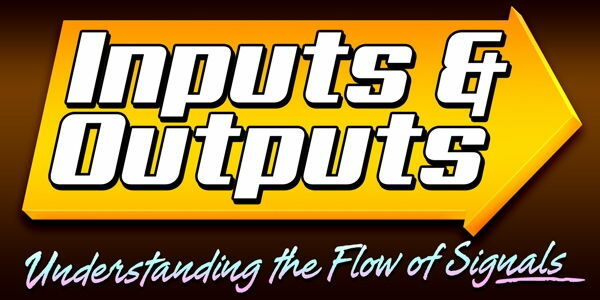 A quick look at the user guide or I/O panel should tell you immediately whether a socket is an Input or and Output. There's no easy way to connect a multi-channel speaker system designed for a computer to a home theatre receiver designed for bare wire connections. New technologies are starting to reverse some of these guidelines, but for the sake of preventing information overload, we're sticking to the basics here! It's our job to know about all the different ways a home theatre can be configured in order to get the most out of it, and there's no way we can cover our entire catalogue in a single blog! So, if you're stuck on how best to wire up your home theatre, don't hesitate to contact us - we'll find a solution or at the very least point you in the right direction to avoid a wild goose chase.